Alabama is having some special guests in Tuscaloosa for practice this weekend, as the annual Nick Saban Coaching Clinic is taking place this weekend. 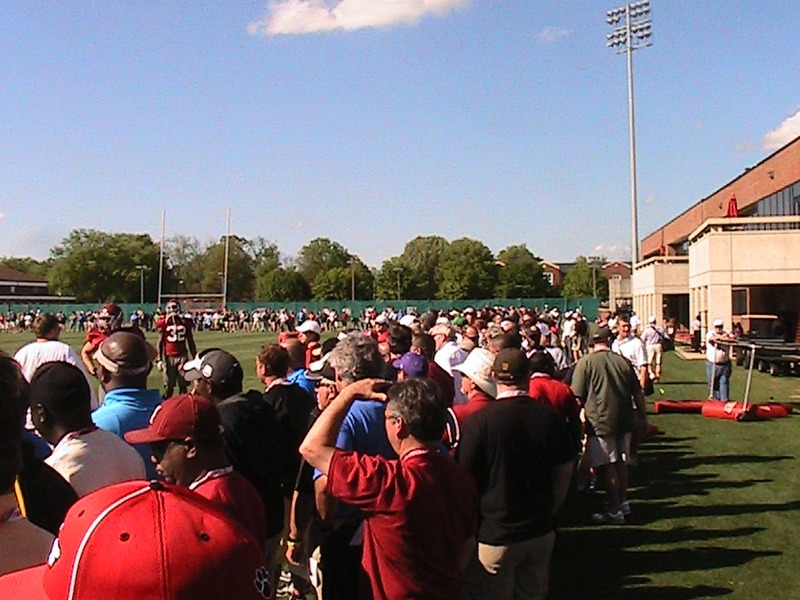 Here are some pictures of the crowd, estimated to be over 1,250 coaches. 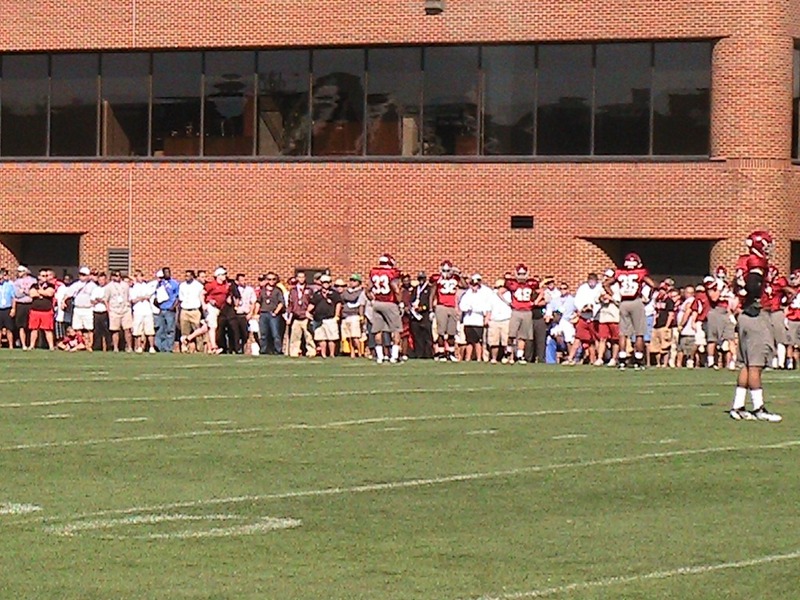 As you can see, the coaches lined up several men deep to get eyes on practice. They even looped around the entirety of the field in use (as you can see below), which by my guess is about a football field and a half, maybe close to two. Check the backgrounds. That’s all visiting coaches. As for on field action, you can see some injured players below working on exercise bikes with strength and conditioning coach Scott Cochran. 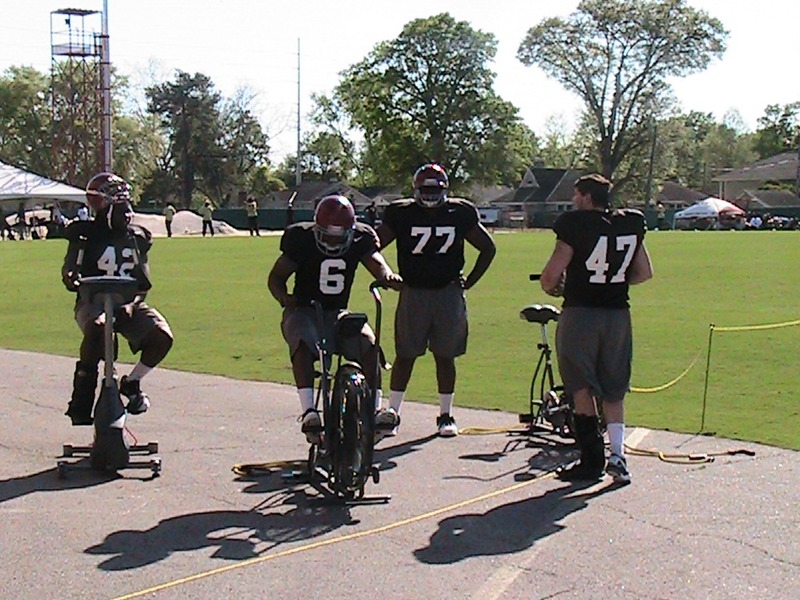 The players are RB Eddie Lacy , RB Blake Sims , OL Arie Kouandjio , and TE Corey McCarron . To cap it off, I have the usual BrettAtBama Practice Video below for you. Enjoy! Going to the land of cowbell and getting a win is no easy task, no matter how good or bad the team may be at that stage in the program. Looking into the game itself, props must be given to Trent Richardson and Eddie Lacy for their performances tonight. Richardson continued his incredible season with 127 yards on 32 carries and a touchdown. Lacy had two touchdowns in the process of gaining 96 yards and showing many viewers that his foot injury is a thing of the past. Outside of those two, the offense was seriously struggling this week just like it did last week. Now, last week’s performance can be chalked up to playing against one of the nation’s top three defenses, but the same cannot be said for Mississippi State. Surely there are some things that the Tide will look to improve on before Georgia Southern, including converting on big play opportunities that were missed via overthrows and other errors. The defense, however, was solid. Mississippi State’s throwing quarterback, Tyler Russell, had only 110 yards in the air. Alabama’s physical nature wreaked havoc on the Bulldog offense, including injuring starting quarterback Chris Relf. Another quick round of applause should be given to Alabama’s running defense, holding the Bulldogs to a total 12 rushing yards. Things to improve on: I hate to be that guy, still talking about this, but for me, it’s the kicking game. This unit didn’t have as much of a profound effect on this game as the last one (mostly because they weren’t put into that position like they were last week), but the performance needs to improve, because if that situation were to rise against against Auburn or in the postseason, the confidence to perform well might not be there. As usual, there will be a full week of coverage right here starting on Monday leading up to the game with Georgia Southern. What an absolutely insane week here in Tuscaloosa. 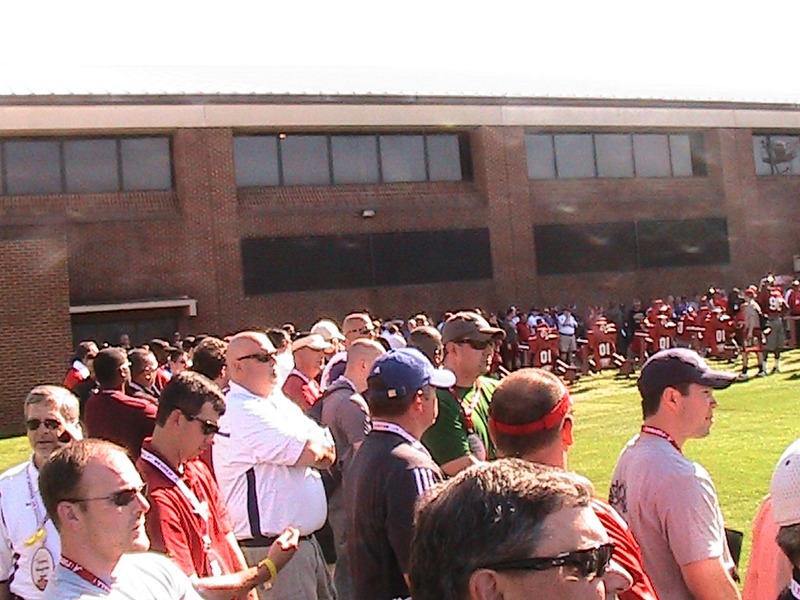 The biggest of big media outlets were running around the Mal Moore Athletic Complex all week: Tom Rinaldi of ESPN, Bruce Feldman with CBS, Chris Low with ESPN, you name it. Let me bring you all the headlines from the madness in this week’s BrettAtBama Week In Review. The right guard spot is seeing some turbulence this week. Anthony Steen was the starter all season long until suffering a concussion, paving the way for Alfred McCullough to start and perform very well. The two have battling for the start against LSU this Saturday since Tuesday of the bye week. Saban said that both are healthy and ready to go, and that he will choose whoever performs the best in practice. While on the topic of injuries, Saban said in his Wednesday post-practice press conference that there were no injuries or personnel issues to report. That’s a very big deal going into a game that will be one of the most physical games played all season long. Also, Eddie Lacy was hobbling pretty badly in practice on Wednesday, however it wasn’t nearly as bad as it had been in previous weeks. That doesn’t mean he is a lock to get playing time, but it looks more likely this week than the other weeks did. Summary, complete. Gametime is inching closer, ladies and gentlemen. Hello, Readers! The football team was given a rare day off today, in hopes of resting the team a little bit during the bye week and letting some players rest some bumps and bruises. But the program didn’t come to a complete stand still, as we some important injury information. Here’s what’s important. Pass-rush specialist linebacker Alex Watkins did indeed break his arm against Tennessee, and Saban expects him to be out for two to three weeks, having him returning to practice hopefully in time for the Iron Bowl. The offensive line has had some injury issues of late, which is now compacted by the fact that the offensive line is now without a Kouandjio. Arie has had a nagging injury for some time now that required surgery, and now his little brother Cyrus will be having knee surgery. Cyrus is often seen as the No. 6 offensive lineman, and his absence could be felt. However, he is only a freshman, so he has plenty of time left at the Capstone. Also on the offensive line, guard Anthony Steen looks to be improving from the concussion he suffered against Ole Miss. He could be close to, if not at, 100% when it’s time for the big game against LSU. To finish it all off, it looks like running back Eddie Lacy is feeling better. Against Tennessee he had seven carries for 46 yards, where in the three previous games he had ten carries and 54 yards combined. The bye week will certainly help him. Check back as time goes by for more updates on his status. Have a good week!